MoviePass is pretty great you guys. Found myself with an open afternoon so I figured I’d stop by my local Century Cinema 16 today to see newly-Oscar-nominated-but-really-I’ve-been-wanting-to-see-it-anyway Get Out. It was really good it turns out! I guess sometimes the self-congratulatory circle-jerk movie awards organizations happen to pick productions of actual quality and not movies engineered specifically to sway judges. A broken clock, amirite? And it turns out, they still do trailers before movies, and many of them are for movies that are derivative works of a prequel/sequel/remake/adaptation nature. Hence, the HUR returneth. It’s not the metric of original storytelling we want, but something about great responsibility. A pretty barebones teaser, but apparently this Charlize Theron film about a beleaguered mother getting unexpected help from a mysterious nanny (who probably doesn’t even have the power of flight or jumping into sidewalk chalk drawings) was well-received at Sundance. No mentions of source work inspiration, so we’ll say ORIGINAL. A REMAKE of a 1974 film starring Charles Bronson (itself a book adaptation). Even if it wasn’t, a regular guy going vigilante when they COME AFTER HIS FAMILY NOW IT’S PERSONAL isn’t a new concept. But look, this time it isn’t an aging Liam Neeson, but an aging Bruce Willis! That’s what you were waiting for, right? This felt well-paired with Get Out thematically, though I suspect it’s less of a thoughtful spotlight on issues of racism in modern America and more people getting chased around by scary bikers through happenstance. Otherwise appears to be an ORIGINAL story. Soldiers fighting terrorists off-duty, and Clint Eastwood is directing? Nice to be warned in advance about movies I’m never ever going to see, even with the MoviePass discount. A true-story ADAPTATION of an autobiography, for whatever that’s worth. Oh hey, a Tyler Perry/Tyler Perry writer/director joint. A fairly derivative-looking tale of revenge, doesn’t look like it’s worth seeking out if you’re looking for something new. That said, ORIGINAL. Unless it’s secretly part of the Madea cinematic universe. Although I initially got a strong Panic Room vibe watching this trailer, it ended up feeling like one of the Neeson pics I alluded to earlier. Gabrielle Union made it look way more interesting, though I worry that the film industry thinks we’ll only buy into women fighting oppressors when their kids are on the line. I’ll keep holding out hope for a Jane Wick someday to prove them wrong. ORIGINAL. 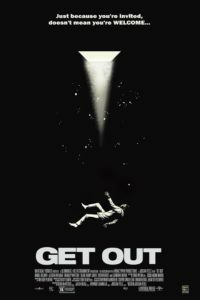 As of a January 26th, 2018 screening of Get Out at Century Cinemas 16 in Mountain View, CA, Hollywood was projecting 33.33% unoriginality for its upcoming movies. Not too shabby, Hollyweird! Now get working on more comeuppance for abusive men in power.